Health Industrialization discusses the way healthcare professionals distinguish between medicine, surgery, and diet and lifestyle guidelines. In other words, the ways that medicine aims to provide quantity of life. Men and women would rather remain in good health as long as possible and compensate for the deficiencies that crop up to the best of their abilities. Hence, they are looking for quality of life that results in tensions brought on by different objectives. 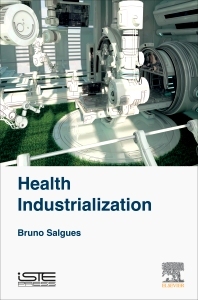 This book hypothesizes that this tension is the cause of an industrialization of medicine or health that depends to a degree on the point-of-view we choose. Anyone interacting with information technology in a healthcare setting. The audience includes graduate students and fellows in medical informatics, physicians, nurses, managers, programmers, analysts, and administrators. In addition, it will be of interest to information technology professionals in related industries such as pharmaceutical and health insurance companies. 8.2 Are there temporal paradoxes? 9.4 Conception or has man become yet another object? Bruno Salgues is Director of Studies of Institut Mines-Télécom in Paris, France. He is also a University lecturer and researcher at the TIC&Sante in Montpellier.